Amazon has zoomer Show Pony for $27.99 (Reg $80) with free shipping. 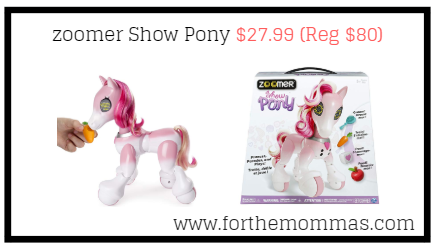 Zoomer Show Pony is responsive to touch and moves in the same adorable way real ponies do! Pet her nose or cheek and she’ll react by nuzzling affectionately into your hand. You can even train her to perform tricks, like singing and dancing. When your little pony gets hungry, feed her using the apple accessory. Hold the bright red apple to her mouth and she’ll make cute chomping, crunching and biting noises!